The Little Owl was introduced to UK in the late 19th Century, and has now become a firm favourite with all that see them. 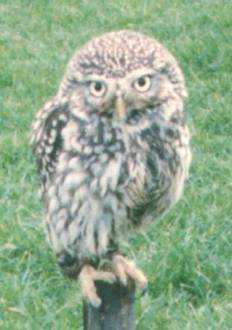 They are only 21cms tall and weigh between 140 to 225 grams this makes them the smallest Owl in the UK. They are noisy little birds and can often be seen bobbing up and down on fence post during late afternoon early evening. They have a varied diet of insects, worms, small mammals and birds. Because of their size they can nest in a lot of places from hollows limbs of trees to empty rabbit burrows. Little Owls take to well designed nest boxes quite quickly, we have included a tunnel on the side of our box as they love these, and they close their wings and fly into it like a dart. Boxes should be fixed a minimum of 2 metres from the ground and out of the midday sun, because of the design there is no problem with wind. Inside the nesting box you can place wood shavings or sand but this is not necessary. The Little Owl breeds from April to May and lays 3 to 5 white eggs which take 28 days to hatch. The young will leave the nest when they are about 4 weeks old and the parents will carry on feeding the owlets for a few more weeks until they are able to hunt for themselves. The box will need tobe retreated every couple of years. At the end of the season it is advisable to clean out any old nesting material. If squirrels, jackdaws etc take any nesting material in this should be removed as the owls will not use the box with any twigs etc in it.